The club fee is only $60 per term - our terms are the same as the school terms. We provide all of the equipment and have three friendly,experienced coaches who love teaching the sport. 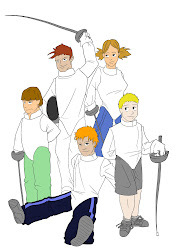 For Van Diemen Fencing Club (Hobart, Tasmania) information, please visit our website: www.vdfencing.com. What an epic night! Food, friends and fencing! who want to try fencing? We run fencing taster sessions. or run over several weeks. want the taster done at our club. Don't forget what date/s and times! Please see our website for our 2016 calendar. Van Diemen Fencing Club opened in early 2011. We provide fencing lessons for groups and individuals. We are also available to run fencing at birthday parties and fencing tasters for groups. Our coaching philosophy is that fencing should primarily be about having fun, with winning as an added bonus. Coach Avery Holderness-Roddam began fencing in 2000 and has won medals Nationally and over-seas. He has trained in London and Milan and loves teaching others this fun and addictive sport! Introducing 'A Stab in the Dark', VDFC's quaterly publication. Containing news, tournament information, useful websites, fencer profiles, jokes, stories, poems, or anything readers would like to contribute. We will have limited space to advertise other clubs and fencing suppliers so get in quickly. Do you have any fencing experience?